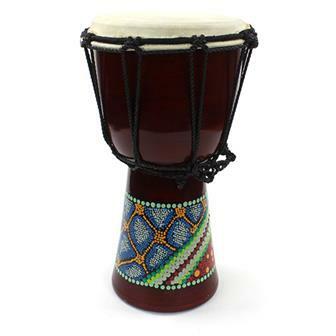 Our range of Fair Trade world drums has changed and refined over the years. 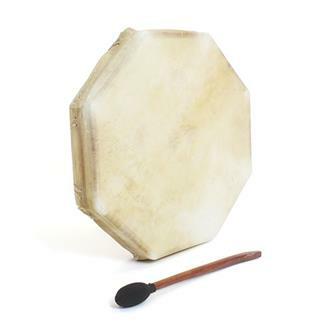 We now stock our very popular shamanic frame drum in two distinct shapes over various sizes and a healthy range of traditional Indian drums for festival and dance. 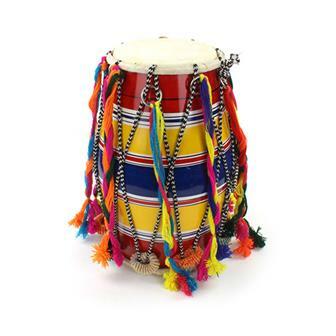 Simple and colourful this small double headed Indian drum is perfect for a party. The skins can be tightened or slackened by adjusting the metal rings on the ropes. 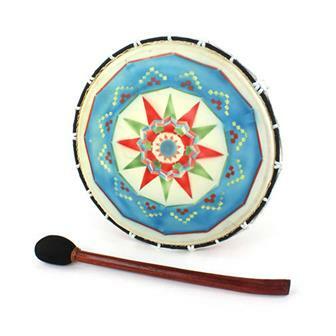 This small brightly painted version of the dhol is traditionally used all across South Asia at weddings and other festivals and is a major component of modern bhangra music. 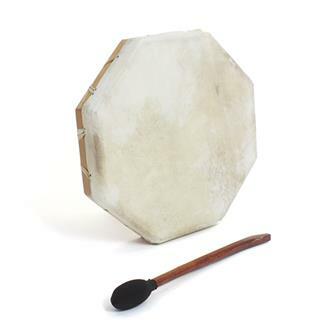 It is a double ended drum comprising of a mango wood shell and metal rings for adjusting the tension on the skins. 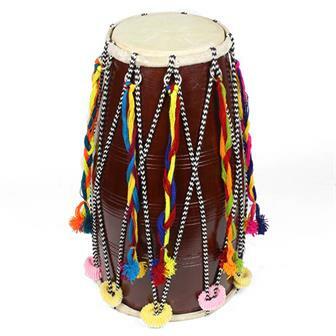 These large glossy finished double headed drums are called dholaks. 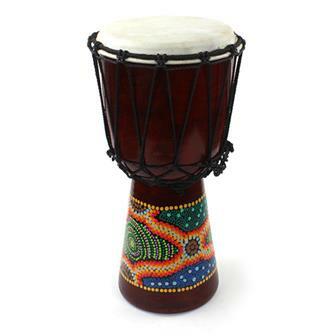 Each fantastic drum has tough nylon stringing and welded metal tension rings. 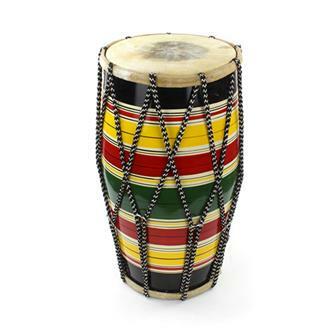 Although it originated in India, the versatile dholak is now used in a huge number of global musical styles. Colours & patterns may vary. 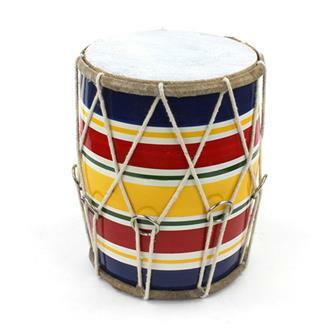 This large, brightly painted and vibrantly decorated version of the dhol is traditionally used all across South Asia at weddings and other festivals and is also a major component of modern bhangra music. 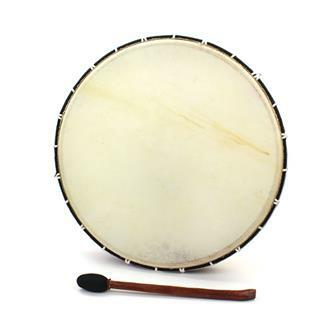 It is a double ended drum comprising of a wooden shell and metal rings for adjusting the tension on the skins. 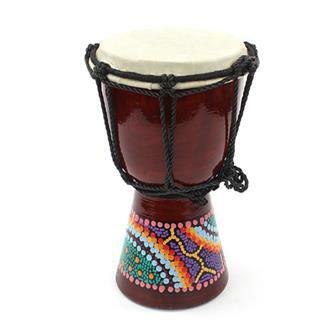 This gift djembe is a cute, little decorated drum with dot painted designs. Whilst not a very loud instrument, its great for finger drumming excercises. This drum is hand painted so designs will vary. Play or display? That is the question! 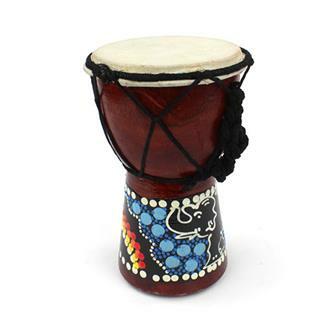 This mini djembe is hand painted in dot designs and is perfect for finger drumming, and small enough to fit in a bag. This drum is hand painted so designs will vary. 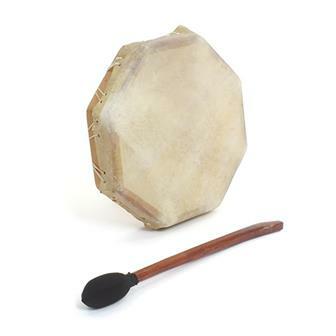 This is the biggest of our gift sized djembes, its a perfect gift for bringing rhythm to somebody's life, whilst small enough to not take over the room. This drum is hand painted so designs will vary. 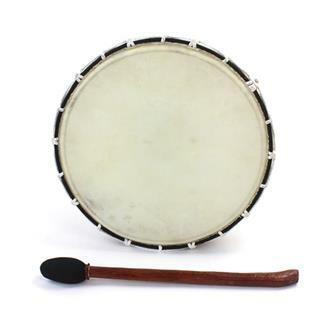 Our best-selling drum! 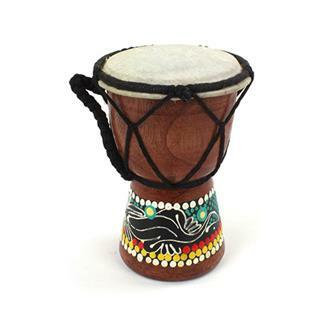 Cheap and cheerful, this wooden djembe is both a great ornament and a decent instrument, a small and well formed, functional drum. 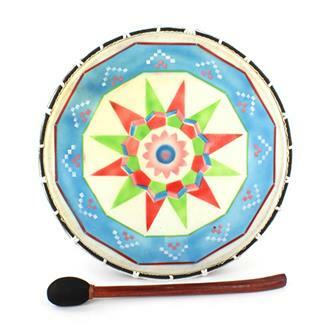 This drum is hand painted so designs will vary. 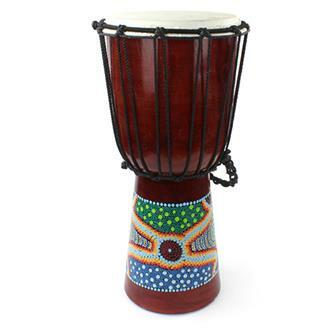 These beautifully decorated, handmade items are our entry level djembe to the world of serious drumming. 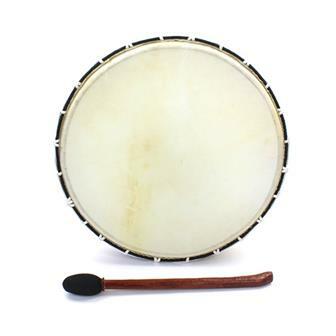 Great for beginners, they boast a 7" goat skin head, tough, secure stringing and a versatile tone. 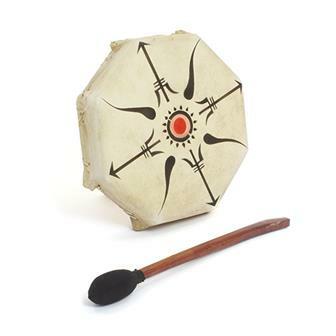 These delightfully dot painted djembes are hand carved from suwar wood, have a traditional rope tuning system and a 9" goat skin head. From resonant bass tones to bright, crackling slaps, these djembes are an excellent choice for any drummer. 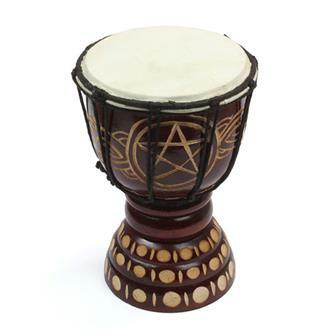 Small wooden djembe drum with dark varnish carved with a pentacle design, strung with nylon and with a goat skin head.